On January 3, the U.S. House of Representatives passed Rules creating a new Office of Diversity and Inclusion, and mandating appointment of a Chief Diversity Officer and creation of a diversity plan. These measures were the outcome of consultations with the Joint Center for Political Studies, a partner with Diversity Declaration. The new rules reflect the historic diversity, and Democratic majority, of the House coming out of the November elections. Andy Kim won! His long-shot bid unseated a Republican incumbent and staunch Trump supporter, part of the wave of victories by Democrats that brought unprecedented diversity to national and state offices. Dozens of Diversity Declaration volunteers helped get out the vote for Andy, knocking on hundreds of doors, mailing over 550 postcards and making phone calls to voters in New Jersey’s 3rd congressional district. Andy Kim is New Jersey’s first Asian-American Congressman. The election saw a slew of firsts across the country: first Native American, Muslim, and Somali-American women elected to Congress; first openly gay governor; and first openly bisexual senator. States and territories scored their own firsts: first woman governor (Guam), Latina women representatives (TX), female senator (TN), LGBTQI person elected to Congress (KS), and female Representatives (IA). As the Washington Post wrote, in the House of Representatives "The incoming lawmakers...are overwhelmingly white on the Republican side, with only one woman, while women and people of color are a majority of the newcomers on the Democratic side." Diversity Declaration is excited to begin working with Andy Kim to promote diversity in elected government. The Last Weekend: What Will You Do? Diversity Declaration volunteers are making a final push to promote diversity and inclusion in the midterm elections! Can you help us? Every single action up till November 6, no matter how small, matters. Many drops make an ocean- or a Blue Wave! We started off as a non-partisan effort to elect more representatives that truly walk the walk when it comes to inclusion in their public policy AND in practice. But we recognize, as our allies at Indivisible recently put it, white supremacy IS on the ballot this year. We’ve been working to flip just ONE Congressional seat- New Jersey’s third district. We joined as co-hosts for a fundraiser in early October. On October 20 and 21 — to get out the vote to send Andy Kim to Congress — 18 of us drove to New Jersey and knocked on hundreds of doors; groups met in homes and wrote over 550 personalized postcards to NJ-3 voters; and volunteers have spent hours phone banking through a link provided by the campaign. “This election isn’t about a single issue or candidate. This election is about the soul of our country. It’s about whether Trumpism is a blip or an era. There is no limit to their cruelty -- which is why we must do everything we can to limit their power. Forward this to a few friends: We need everyone to get involved in the next few days if we want to stop this administration’s hate-filled policies, and bigoted rhetoric. “White supremacy is on the ballot in this election and every election. And this time Trump is saying it loud and clear for all to hear. Love alone won’t trump hate. But side-by-side, arm-in-arm, neighbor-to-neighbor is how we defeat this administration’s bigotry and fear mongering. How can we recruit a new generation of winning candidates? "How can we recruit a new generation of winning candidates? Three young, recently-elected Democrats talk about what it’s like to run for office." This is the lead-in for the for the latest episode of the podcast The Wilderness, titled "The Bench" -- featuring TWO of our diversity champions from Virginia, Danica Roem and Jennifer Carroll Foy! Have a listen, and remember: this is why our group got active -- to build a bench of diverse candidates around the country. Just as a few actions from each of us helped get these candidates elected in Virginia last year, with our individual actions leading up to November 6 we will keep building up The Bench! Will You Stand with Us for Diversity in Congress? You like our photos, read our tweets and click through our newsletters. We know you care about diversity and right now we need your help to get Andy Kim, New Jersey’s 3rd district challenger for Congress, over the line this November. Diversity Matters has agreed to join the host committee for Andy’s last big event in Washington DC on October 2nd. This reception is an opportunity for us to come out and show that Diversity does Matter. Former U.S. Secretary of State John Kerry supports Andy and will join us on October 2ndas the special guest. CONNECTICUT: JAHANA HAYES https://www.facebook.com/jahanahayesct/won the Democratic nomination to represent the solidly Democratic 5thDistrict, with 62% of the vote. If she wins in November, she would be the first African-American Democrat elected to Congress from Connecticut. The 2016 National Teacher of the Year, she was endorsed by the Working Families Party, the Congressional Black Caucus, the state AFL-CIO and Sen. Kamala Harris. During the campaign, she talked about growing up in poverty, and supported single-payer healthcare. GEORGIA: LUCY MCBATH: “In Georgia’s Sixth Congressional District, which saw the first stirrings of the 2017 resistance when newcomer Jon Ossoff almost won a seat that hadn’t gone to Democrats since the 1970s, Moms Demand Action champion and racial-justice crusader Lucy McBath won her runoff against South African immigrant businessman Kevin Abel.” Check out this detailed analysis of Georgia’s critical races in The Nation. KANSAS: SHARICE DAVIDS won the Democratic nomination from the 3rdHouse district. If elected in November, she would be the first gay Native American elected to Congress and the first openly LGBT person to represent Kansas in Federal office. MICHIGAN: RASHIDA TLAIB, who is Muslim, beat a crowd of opponents to win the Democratic nomination for the 13thCongressional District. There is no Republican running for this strongly Democratic seat. ILHAN OMAR won the Democratic nomination to represent the 5thDistrict, which is heavily Democratic. Currently a state House representative elected in 2016 who is Somali-American and Muslim, her website casts her as the potential first refugee in Congress. VERMONT: CHRISTINE HALLQUIST, a former energy executive, became the first transgender person nominated by a major party for governor in the country. Against this backdrop, record numbers of women have won primaries this year, mostly Democrats. There are 71 congresswomen running for re-election, and in all nearly 50 African-American women have run for Congress this year. Diversity Declaration is promoting Andy Kim's exciting bid to be the next U.S. Representative from a swing District: New Jersey's Third. Andy emerged quickly after the election of November 2016 as a progressive leader helping mobilize others past fear and despair on to constructive action and engagement in the political process. Drawing on his experience and networks, in November 2016 he launched Rise Stronger, http://www.risestronger.org which has been a partner to our efforts at Diversity Declaration, and organized a major networking and mobilization event in conjunction with the Women's March on Washington. NJ-3 is prime territory for our action: in south-central New Jersey just outside Philadelphia, with people of color making up 19% of its population. Andy's message, and ours, can reach the voters he needs to take the seat, if WE get involved and help him! Republicans are focused on keeping Andy's opponent, incumbent Representative Tom MacArthur, in office. MacArthur led the Trump Adminstration’s attempts to repeal the Affordable Care Act in 2017 and end requirements to cover pre-existing conditions. Andy is an Asian American candidate who grew up in NJ-3. He is a Rhodes scholar. As a career public servant, Andy served two years in the Obama White House as Director for Iraq at the National Security Council, where he was a point person coordinating the global effort against the Islamic State. He had previously served in Kabul, Afghanistan as a U.S. diplomat and strategic adviser to Generals David Petraeus and John Allen. Andy also served in the Pentagon, the State Department, USAID and the Senate Foreign Relations Committee. CNN, Cook Political and Inside Elections have downgraded MacArthur's chances of elections in the past two months. Democrats now hold a 17,000 registered voters advantage over Republicans in the district, up 4,000 since 2016. Public polls show Andy in the lead when poll respondents are informed of MacArthur's record on healthcare and taxes. But the race is going to be a CLOSE one. Every single door knocked, every phone call, every bit of voter contact will make a difference. Think about what you can do to help us get this diversity champion into office in November! Want more info about this race? Check out this excellent analysis from our friends at Swing Left! 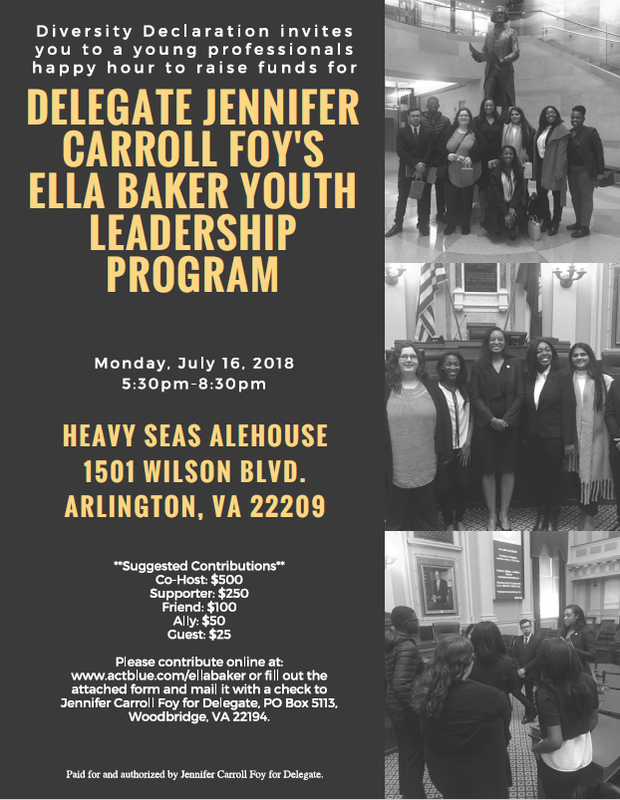 Diversity Declaration joins Virginia Delegate Jennifer Carroll Foy in inviting young professionals to a happy hour on July 16, aiming to raise at least $2,500 to send six to eight diversity high school students to learn first-hand about state government in the Virginia State Capitol next year, free of charge, in Delegate Carroll Foy’s Ella Baker Youth Leadership Program. Through the Program, named for the civil rights leader, the students sit in subcommittee meetings, meet advocacy groups, shadow the Delegate, and meet with Governor Northam and Lt. Governor Fairfax. Check out our events page for the details about joining! NJ-3: Andy Kim, an Obama Administration national security official endorsed by former VP Joe Biden, and the founder of www.risestronger.org, secured the Democratic nomination, running unopposed. He now must wage an uphill battle going into November’s general election, against wealthy Republican incumbent Tom MacArthur. NJ-3 has 12,000 more registered Democrats than Republicans, and Cook’s Political Report has shifted its rating of the district to the left this year, though NJ-3 voted for Trump in 2016 after voting twice for Obama. MacArthur has a vast personal fortune to fund his own campaign. The May Democratic primaries saw victories by a group of female diversity candidates, adding to the momentum that the Diversity Declaration is working to encourage. All these candidates face significant challenges and need exceptional mobilization of support to win. Georgia: Stacey Abrams, 44, is the first African-American to win a primary for governor. If elected, she would be the state’s first woman governor and the first African-American woman governor in the U.S. Georgia hasn’t had a Democratic governor in 20 years. Abrams’ opponent will be one of two Trump-style Republicans; Trump won Georgia by a five percent margin in 2016. Idaho: Paulette Jordan, 38, is waging an uphill battle be the nation’s first Native American governor, in a staunchly conservative, Republican state. Texas: Lupe Valdez, 70, won the primary as the first Latina and openly gay person nominated by a major party in the race for governor of Texas. The Republican incumbent governor is favored to win in November, and Republicans have long controlled the state, but Valdez has a history of overcoming long odds. Gina Ortiz Jones, 37, won the primary for a House seat. If elected, she would be the first lesbian, Iraq War veteran and Filipina-American to represent Texas in Congress. Her district leans Republican and her two-term incumbent opponent has a much larger war chest so far. Do you like hearing about candidates like these inspiring women? Do you want to help us others like them elected? It's easy and fun! We are tracking several Congressional races closely, and will be focusing on some key races in 'swing' districts within the next few weeks. We'd love to hear from you on any races YOU are tracking, and will cross-post information so please follow our Facebook page and e-mail or message us with your thoughts! Diversity candidates for upcoming Democratic primaries, in increasingly diverse districts with significant immigrant populations, face tough challenges - even from within the Democratic Party. Aruna Miller's strong showing in Maryland's 6th district has made her the preferred target of GOP attack ads. In New Jersey's 2nd district, a conservative, white, male Democrat has the full backing of the Democratic Party establishment, who sees in him its best chance of recapturing a seat held by a Republican for two decades. Progressive activists in New Jersey see the Party turning its back on viable candidates more in line with the values it claims to represent, in service of trying to take back the U.S. House of Representatives. The Washington Post and Politico offer some insight into how things are shaking out in both Maryland and New Jersey. We have joined forces with the Open Society Policy Center by signing on to their Open Letter on "Fundamental Equity and Inclusion for U.S. National Security and Global Engagement." Click here to read the letter. Reminder: our Quarterly Meeting is this Sunday, April 22 from 3pm-5pm at the United Methodist Building, 100 Maryland Ave. NE, Washington DC 20002. We anticipate a great discussion setting out our work for the coming months. Please RSVP with an email (info@diversitydeclaration.com) if you have not already. With Conor Lamb's recent Congressional victory in Pennsylvania, Diversity Declaration sees the November 2018 mid-term elections as ripe for unexpected victories by untraditional candidates. Watch this space in the coming months for reports about interesting candidates - and send us your ideas! Our research volunteers are hard at work and would love insights on interesting candidates. Our research shows that the southeast corner of Pennsylvania, around Philadelphia, might be our richest target for Diversity Declaration work and collaboration. The recent Pennsylvania Supreme Court ruling on illegal gerrymandering only increases the possibility of significant political change in that state. Five districts were previously identified as possible candidates for flipping; the court-ordered redrawing of the electoral districts could create more change. Maryland politicians could be good recruits for the Diversity Declaration given their senior status in the leadership and their ability to publicly advance more progressive policies and platforms. Maryland's Congressional District 6 will have an open seat, and our volunteers have already been busy engaging several of the primary candidates! Want to help us select target races? We'd love your help! E-mail us at info@diversitydeclaration.com to get more involved. On February 15, we joined about a dozen other organizations signing onto letters sent by the Joint Center for Political and Economic Studies to Senator Menendez, recently reinstated as Ranking Member of the Senate Foreign Relations Committee, and Senator Cardin, recently appointed Ranking Member on the Senate Committee on Small Business and Entrepreneurship. Commit to hiring at least one person of color for their staff director or general counsel position. Aruna Miller, Andrew Duck, and Nadia Hashimi, candidates for Maryland's 6th Congressional District. We are astounded and thrilled at the victories this month in Virginia! Each and every one of the Virginia candidates who endorsed the Diversity Declaration WON their elections, and many of them won against outrageous odds- they faced heavily gerrymandered districts, dog whistle attacks by their opponents, and dark money. But when we vote, we win. The Virginia legislature now has its first-ever Latina, Asian and transgender representatives and new African-American representatives as well. But we're not finished. Rich and powerful forces will want to get them out again. We can't just leave them on their own- we need to build a bench behind them, so that when they tire, others are trained and ready to step in. In order to ensure a strong pipeline of future leaders, it is vital to reach down and ensure that staff don't just come from the same small talent pool. That's why we have teamed up with Inclusv, Joint Center for Political and Economic Studies, and Virginia Leadership Institute to ask them to take a new pledge. Follow us on Facebook or sign up for our listserv to find out how you can help us reach more and more elected officials to commit to the Diversity Pipeline Pledge. *Support efforts to benchmark and track progress within the legislature and in your own office. Collect and analyze staff demographic information, and support efforts to publicly collect and analyze staff demographic data. We're mad about the Arpaio pardon, and we're outraged but energized by Charlottesville. Ordinary people of every color, religion, and background are speaking out about the need to embrace diversity, counter white nationalism and stand firm in defense of civil rights for all. We are convinced that we are the vast majority of Americans. And we are tired of making the case. What if we didn't need to convince our elected officials of why they needed to stand up for all of us- what if they already got it, and were already there with us? State by state, district by district, we would like to get beyond the tiresome business of asking politicians to take positions on Confederate statues. We're tired of watching state legislatures pander to bigots by banning transgender students' use of bathrooms, or banning Mexican-American studies. Did you know the Virginia state legislature even tried to ban high schools from teaching Toni Morrison's Beloved? We pay taxes. Let's get these extremists out and get some people in who actually want to work for us. We know the odds are against us. Our candidates don't have the money, the connections, the big-name party endorsements that their challengers have. So they need us. We are starting in Virginia because we believe this year's state elections will be a bellweather for the nation. We need to prove that when we turn up, our candidates can win. We're focusing on six outstanding individuals running for state legislature in Virginia. They have all made public commitments stand up for the principles of the Diversity Declaration, and are matching their actions to their words. They are Hala Ayala, John Bell, Jennifer Carroll Foy, Elizabeth Guzman, Danica Roem and Kathy Tran. They are experienced. They are highly qualified. They care about the issues that affect most Virginians' daily lives. And they will be the base for a different kind of network in state politics, one that opens doors for more and more people outside the 'old boys' network in future. We believe there are many more Diversity Champions out there, but let's prove our point with these six. Help us help them win their seats, and begin a movement in state legislatures across the country. Our events page will tell you more about opportunities to get involved. Any small action you can take will make a difference. And just think how good you will feel about winning back some of these seats in November!